“I took Old Road out of the lorry for his last ever visit to Ballindenisk. He jumped out with the usual spark in his step and looking as good as ever. He trotted around the practice ring, eyeing up his competitors and wondering where his first fence was and when I would give him the command to go. We entered the showjumping arena and I am sure he was thinking to himself, there is something not quite right here. The two of us looked at the course of fences and I knew that if I asked he would jump a clear round for me, but he was there for a different reason, there to say goodbye to those that supported him. “The big screen came on and it was like the penny just dropped for Old Road. He quickly stood to attention as he watched his brilliant career unfold before his eyes and it was then that he truly realised what he was all about. There seemed no more fitting place to retire this stalwart of eventing as it was in Ballindenisk that we some of our best memories. There isn’t a horse in the country with a heart as big as Old Road and he loved his job but he has done enough for me and Irish Eventing. Old Road will always be a very special horse and he will have a well deserved retirement in the field with Fernhill Clover Mist. “My Old Road always got me home and now we both have the memories to look back on. Thank You Old Road and to John Butler for believing in us”. Owned by John Butler, the 18 year-old Puissance gelding was bought as a three-year-old in Goresbridge sales and produced by Mike Ryan up to International level. Although he was bought for hunting, Ryan quickly realised that Old Road was destined for a brilliant career in eventing. 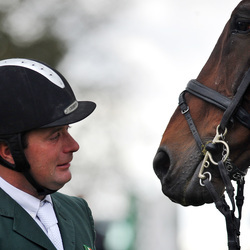 Retiring on a staggering 957 eventing points, Old Road was instrumental in securing vital places for Team Ireland in recent years. This year, the duo’s performance at Ballindenisk, where they took the runner-up spot was vital in Ireland’s quest for Olympic team qualification. Over the years, Old Road has delivered some great results and has always pulled it out of the bag when needed. The combination competed four times at Badminton, and this year was to be his last one. He has an impressive record, which includes three European Championships, the first in 2003, then in 2005 and again in 2009. He also went to the World Championship in 2006. In 2009 they finished runner-up to Trish Ryan and Fernhill Clover Mist in the World Cup Qualifier at Tattersalls. In February this year, we took runner up at Ballindenisk CIC*** and this was a very important result for the Irish squad on foot of the Olympics.